I have my own Mallam. My supplier of the Finest suya spice blend. I’ve know Mamanga for over a year since my friend B and I first ordered a whole Suya-Roasted ram from him. Yes, a whole ram for our personal consumption. Ok…well for us and our families….a grand total of 9 people. So yes, such excess. Such meat. Such deliciousness. Please don’t be so harsh. Judgemental. It cost us just under $350 which we split 2 ways and it fed us for months, safely stashed in the deep freezer. Every time the cravings struck, we would pull out a slab, set it on defrost in the microwave and when warm, slice it into thin strips which we gobbled up for dear life. See, my friend B had just returned from the US after 5 years away. She had a short list of cravings which included Amstel and Suya. Like myself before her. Suya is something that drives Nigerians up the wall. To distraction. That is the epitome of ‘home’. 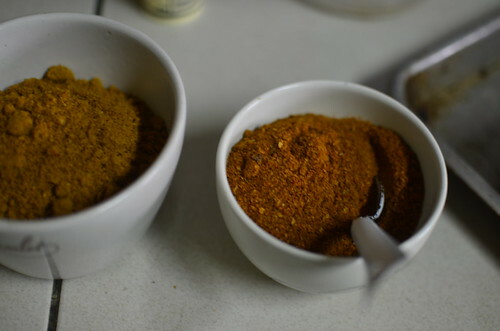 With the roasted ram came 2 mini buckets of the suya spice blend: one to sprinkle on the meat while it cooked, and the other to serve alongside. I was impressed. My knowledge of Yaji – suya spice, hadn’t extended that far. And so Mamanga began hearing from me regularly. 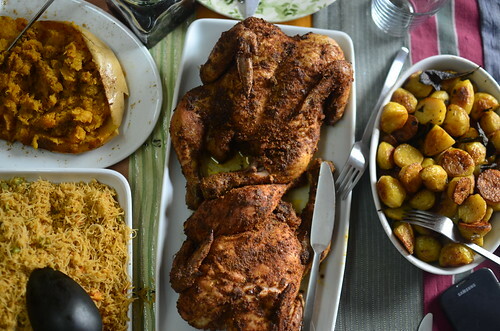 When it was my daughter’s birthday two Julys ago and I decided I was going to invest most of my energy on planning her tea party….I opted to roast whole chickens which I ‘dressed’ with suya spice. Let me tell you, awesome doesn’t describe how good it was. Neighbours, sisters, friends kept coming back for more. And all I’d done was liberally coat the chickens in the spice, drizzle the barest minimum of oil and set in a very hot oven to roast. When I was heading to Edinburgh, I ordered a batch to take to my sister. 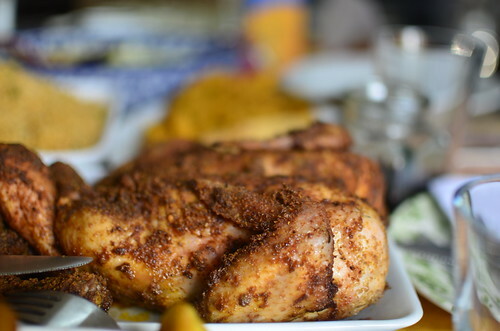 When I headed to the US in the summer, I got some more for family….and when I had to send a care package to my dearest friend, B for Christmas past, suya spice was what she wanted and what I sent. 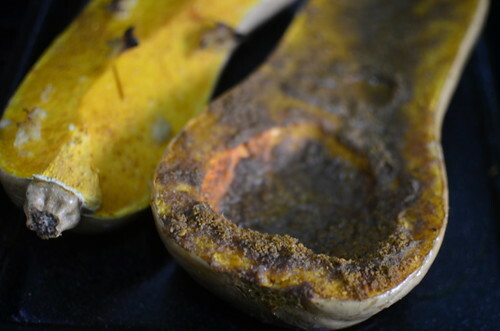 In spite of all this, I had no idea that the peanuts that went into it (for it is a nut and spice blend) were milled to rid them of the oil and then dried…before being crumbled and blended with other dried spices to create this unique blend that is extremely complex and an excellent tenderizer. We call it Kuli-Kuli. Its so amazing that my daughters have been using it in everything they cook. Which isn’t more than stir-fried rice and eggs: scrambled and whites. But they rave. Rave they do…about its deliciousness. Though I’ve used suya spice in mostly ‘meat’ applications, this Christmas, I was determined to have it at the fore and centre of my very Nigerian meal, that consisted of Stick Rice, and a few other things. 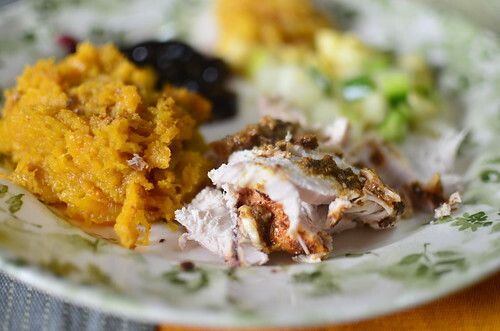 My plans – Roast a few butterflied chickens, as well as spice butternut squash with it. Both went into the oven at the same time…..and emerged perfect and delicious. 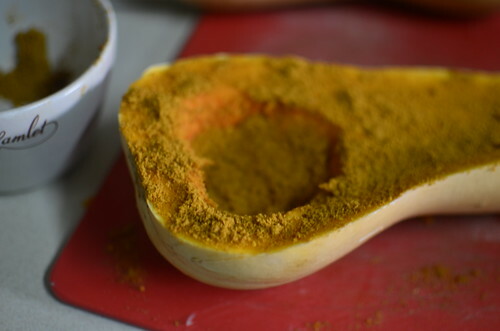 But….but….it was the butternut squash that had me. 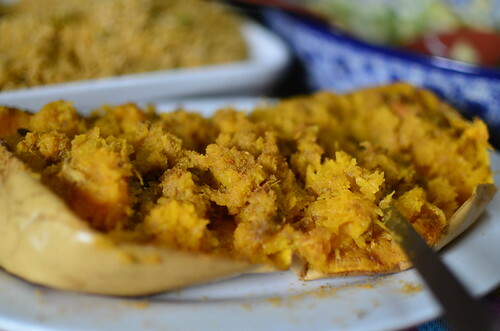 Think on it – sweet squash. 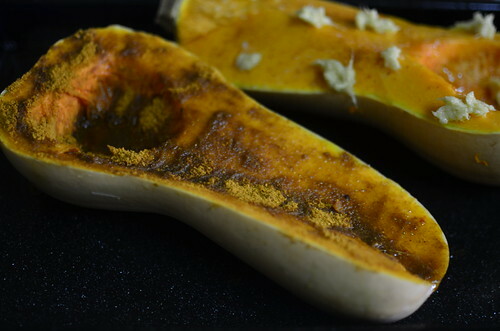 Roasted to deepen said sweetness and the essence of the gourd. Then imagine multi-layered….many notes of spice. Nutty from the roasted peanuts. Heat and spice, from the chilies, dried ginger and garlic, umami from bouillon cubes and a special sleight of hand from Mamanga. What emerged kept me at the table. Feasting. Celebrating. Embracing the depth of my Nigerian heritage. Loving my Yaji, and determined to learn to make (and share) the recipe with you in the New Year. Till then, I’ll be embracing my inner Suya woman, and loving the spice. Get a cup or two of the finest Suya spice you can lay your hands on. Set oven to the highest, in my case its 260 degrees C.
You will set the final tray to cook in the middle of the oven – so set a rack to receive the spiced vegetables and chicken! In this case, I set both to cook in the oven at the same time…………saving time and money :-)! Cut it in half. Using a spoon, scoop out the seeds and the fibres. Set on a baking sheet then sprinkle the suya spice into the cavity and on the flat part. Drizzle with a tablespoon or so of olive oil. Bake till cooked, about an hour or so depending on its size. Its done when the hard outer shell softens, and a sharp knife, or the tines of a fork slide into the flesh with easy. 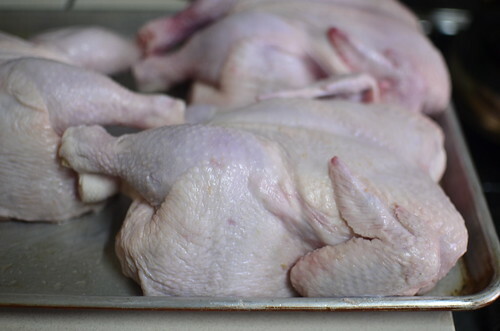 Remove from the oven, and allow to cool down. Serve in shell, with extra suya spice. For the Chicken, which works with whole or parts. 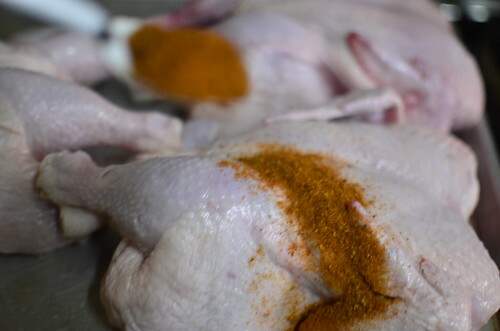 Sprinkle suya spice over the skin and into the cavity. 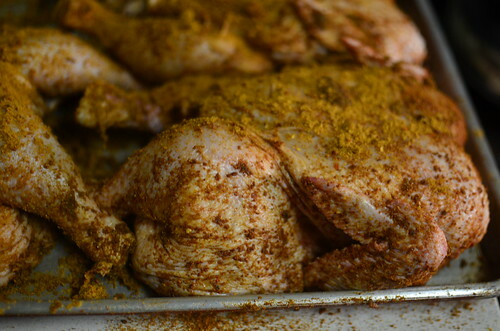 The aim is to ensure that every inch of the chicken is covered in spice. Not just a fine dust but a good, solid rub. You will need no additional flavouring. Roast for an hour and a half, at least for a chicken 1.5kg. The juices, from the things should run clear….. 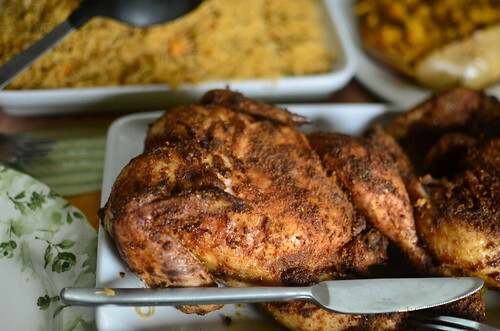 In my case, my chicken was swimming in a pool of suya-spiced oil which I collected once cool, and refrigerated. A taste of Yaji. aka Suya Spice.